Working hard every single day. Most recent addition – building defenses! A screenshot can be found above, with a nice big version if you click on it! The “I” shaped objects represent doors, while the “O”s with the funny curves are windows. A window is currently selected by the player (the red circle) and a little image shows you how fortified it is. Red arrows mark entry vectors. 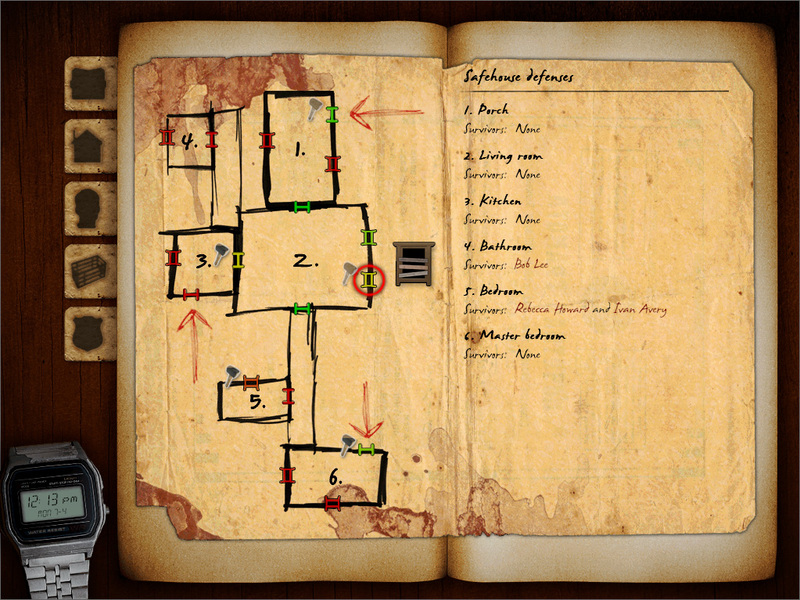 Oh, and survivors can’t walk through barricaded doors or windows… so keep that in mind! Still lots to come, so hang tight! Will be posting more images soon, but wanted to show off the dynamic note system. This is just one type, the post-it. Others include typewritten pages and, well, make suggestions if you like! Development is ongoing and I’m getting closer to an alpha release – much closer than the previous incarnation of Zafehouse 2 ever managed. Trying to hit dates, but it really is unpredictable right now. Just know that I’m working hard on the game every chance I get. This is about 2-3 hours a day right now. Welcome to the new-look Zafehouse 2, or Zafehouse 2.5 to help separate it from previous efforts. 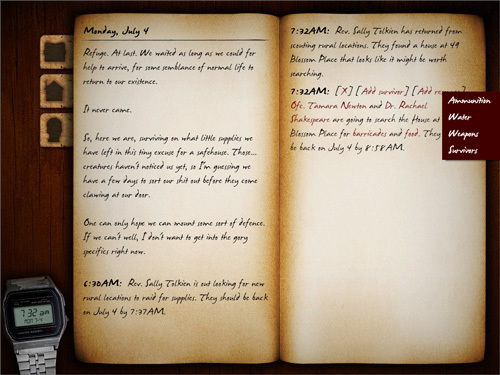 The game is based entirely around manipulation of a dynamic journal. 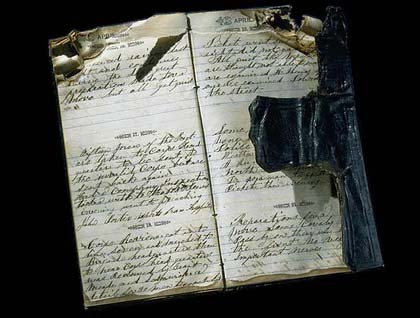 Chapters keep locations, events, supplies and survivor information nicely contained. A special context-sensitive entry system allows you to configure events, lock them in, and then accelerate time. When something occurs, time will stop, allowing you to react however you see fit. Survivors will report in as they return from their adventures, meaning you must rely entirely on them for information. Figure out who to trust, and you’ll do fine. Piss everyone off, and you’re all doomed. Expect more shots and info in the coming weeks. Zafehouse 2 has had a rocky development path. I started on a sequel over two years ago. 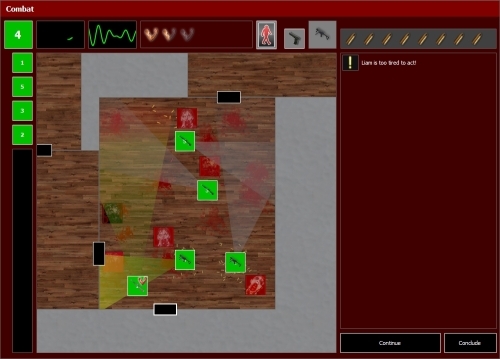 Called Deadshed, it had a quasi-X-COM feel and like the original game, focused on strategy over tactics. It had a neat event logging system which could be filtered depending on what you clicked, so it was easy to see at a glance the entire history of a person or building. It grew, exponentially, until it wasn’t what it needed to be – a successor to Zafehouse. It became its own game, a game I didn’t want to make. Consider it the first prototype. 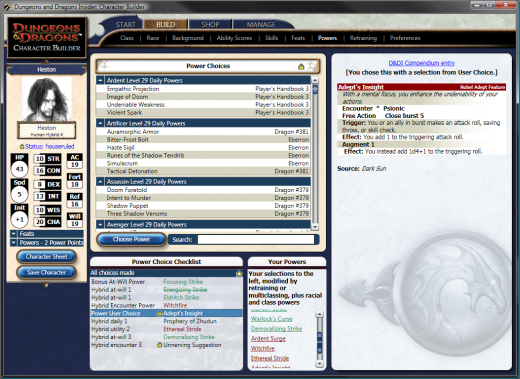 Recently, Wizards of the Coast announced it would discontinue support for the offline 4e Character Builder to make way for an online version powered by Silverlight, Microsoft’s competitor to Adobe’s Flash. A centralised location for the application. 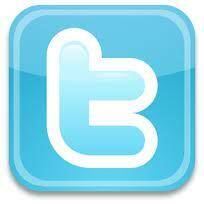 A single, online database that can be updated quickly and the changes reflected instantly to all users. A cloud-based storage system so all your characters are available no matter where you are. Support for multiple platforms. These are the things the new CB promised. Sadly for Wizards, not only was the reception to this news overwhelmingly negative, the launch itself did not go smoothly. Not at all. According to feedback from users on Wizards’ forums, the online builder is slow, crashes constantly, delivers character sheets 100s of megabytes in size and has less homebrew support than the old CB. Commentary suggests that users of the new CB don’t feel like customers, but beta testers. Perhaps the most controversial change is that you must have an active D&D Insider subscription to use the online CB. So unless you pay every month, you can’t use the Builder. Essentially, it’s a big F-U to transient subscribers. It would be fair to ask then, given the relative maturity of the old Character Builder, why Wizards felt the need to move it all online? Why go through the agony of yet another product launch, complete with teething issues, bugs, missing features and the wrath of customers? Very lazy of me, I must admit. One word: Work. Real life has kind of gobbled my time, just as I was making headway on Z2. It could be argued that I should be able to make time for the game, and that’s true, to a point. But Z2 needs large blocks of time spent on it for system implementation; chipping away at this sort of thing will only result in a “bitsy” game. It needs elegance, and that can only come from a holistic approach. I will say that I’m seriously considering redoing combat. Again. The current system, while neat, takes away from what Zafehouse is all about. The game right now is about combat, and Zafehouse was never a combat simulator. I won’t be working on combat though once I get back to Z2. I’m keen to get the relationship systems up and running, as well as the survivor and safehouse stuff. Combat will once again take the form of an event log, like the first game, but it will have a little more depth and interaction to it. But I want to stress that strategy and preparation are key in Zafehouse, not tactics. The current combat system does nothing to support this. Crazy to believe, isn’t it? For a while there I didn’t think it would ever happen, but, after a few hectic days of coding I’ve got it out. 1) It’s a demo! There’s probably 10 minutes of gameplay in this thing, tops. It’s just a taster, a sample. It’s not meant to be a whole game. I desperately wanted to let people know that yes, the game is still in development. The demo is also a platform to deliver feedback on the general feel and direction. Try not to nitpick, but don’t hesitate to offer a comment or two. 2) Read the readme! It contains a list of requirements. Before you start posting that you can’t get it working, make sure you’ve installed all the necessary software and are running the correct operating system. It should go without saying I can’t provide support for anyone running the game under emulation (WINE, VMWare, Mono, etc). 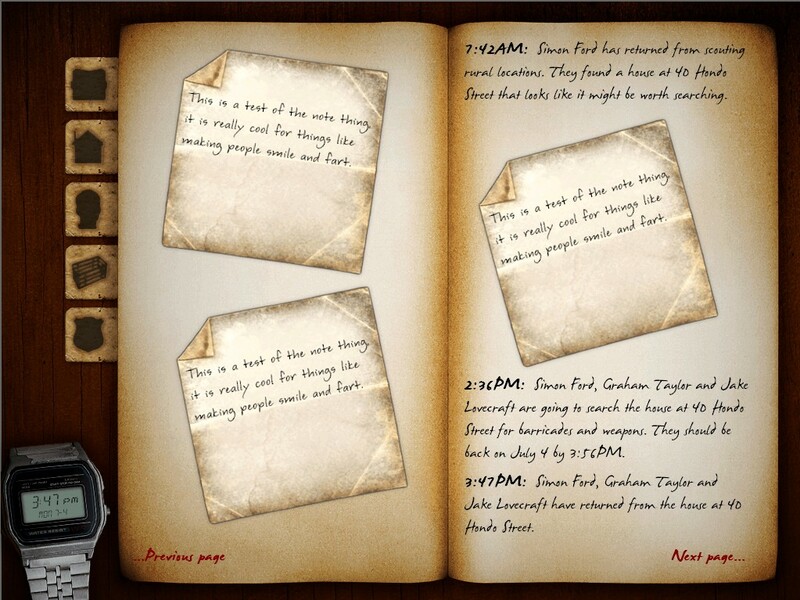 3) Speaking of reading, look at the demo tutorial! If you just jump into the game and are completely lost, be it on your own head. If you read the tutorial and still can’t make heads or tails of things, go ahead and fire some questions. 4) The download is around 8.5MB… just in case that’s going to bust your download limit for the month. 5) Performance. It’s not as fast as it could be, especially when you have a lot of overlapping awareness arcs. Optimising comes much later when the rest of the game is solid. All I can think of for now. Will probably update this post as I remember stuff. Download this replacement executable: http://downloads.zafehouse.com/zafehouse2/z2fix.zip. It should fix the problem. We can track down the exact problem using Dependency Walker. If you’re not afraid of a little techiness, download DW, run it and then drag the SlimDX.dll in the Zafehouse 2 directory into the program’s open window. It’ll tell you straight away what’s missing! I closing in on the tail end of the combat demo and there are no major features going in for the moment. As such, it feels odd doing posts on the blog when Twitter would serve as a much better medium for quick, small updates. So, if you’d like to keep abreast of developments, sign up to the Zafehouse Twitter feed: http://twitter.com/Zafehouse. For major features or changes, however, I’ll be writing them up here on the blog where there’s more than 140 characters to play with. For those who haven’t been following Twitter, I’ve finished implementing the new, saner firing code and am charging ahead with the tutorials and general polish.